What is the YEARFRAC Function? The YEARFRAC Function is categorized under DATE/TIME functionsFunctionsList of the most important Excel functions for financial analysts. This cheat sheet covers 100s of functions that are critical to know as an Excel analyst. 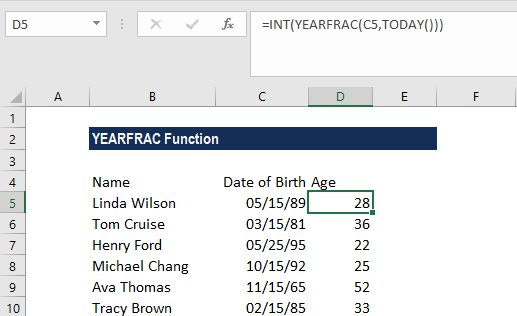 YEARFRAC will return the number of days between two dates as a year fraction in Excel. Start_date (required argument) – It is the start of the period. The function includes the start date in calculations. End_date (required argument) – It is the end of the period. The function includes the end date in calculations. [basis] (optional argument) – It specifies the type of day count basis to be used. 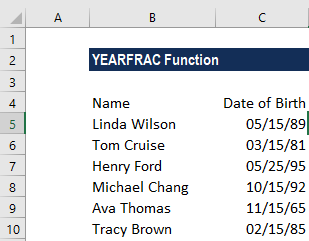 How to use the YEARFRAC Function in Excel? The INT function will output the age value as an integer, which is the day-to-day convention. Now if you want to have a more precise value for age such as a decimal. Just remove the INT() part of the function. Excel will use whole days between two dates. As all dates are simply serial numbers, the process is straightforward in Excel. If you replace the TODAY function with another date you get the age for that person on a specific date. If the date’s you are using are not working, input them with the DATE() function. #NUM! error – Occurs when the given basis argument is less than 0 or greater than 4. The start_date or end_date arguments are not valid dates. The given [basis] argument is non-numeric.